SWIMMING: In the final major event in the Central Queensland Swimming Calendar, the Gladstone Gladiators have gone out with a bang at the CQ Championships in Rockhampton on the weekend. Many swimmers performed well individually and achieved some good personal best times bringing home 41 individual medals including 15 bronze, 12 silver and 14 gold. Congratulations goes to Reagan Copsey for taking out the 9 year old girls Age Champion and the Vorley Newman Trophy for the highest individual points score based on age placings for the 50m events in each stroke and the 200m Individual Medley, and to Kai Devine and Kane Martin who claimed the 12 and 13 year old boys Age Champions respectively. Head coach Tom Fronek described the meet as challenging but he was proud of his swimmers' determination in the relays. "We were missing a few key swimmers for the relays, but it is really pleasing to see the swimmers present step up and put in extra effort to work as a team and achieve great results. "The anchor especially, has to swim hard because everyone is chasing them and they did not disappoint, swimming out of their skins to carry their teams. 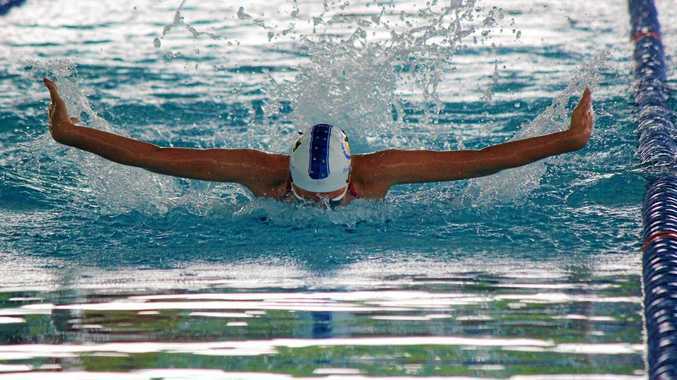 The Gladiators bagged seven medals from eight relays with two bronze, four silver and a nail biting gold medal effort in the boys 8-12 years 4 x 50m freestyle relay on Sunday afternoon. Dubbed 'the most exciting race of the meet', swimmers Kai Devine, Brady Blake and Oscar Wemmerslager were relieved when their anchor Liam Rickard, held on to win with a 0.62 second margin after an impressive chase from Rocky City. Meanwhile, tiny 10 years old Max Williams and Hamish Wemmerslager combined with 13 and 14 year olds Kane Martin and Joel Rickard to tackle the 'giants' of the pool in the Open men's 4 x 50m relay in the final event of the weekend. Max, who is always up for the challenge, said he wasn't nervous standing on the blocks beside the massive 18 year olds because he was pretty sure they were going to come last, but that didn't stop him putting in 100% in his sprint to the finish as the anchor. Max's sister, Amelia however was able to help her two 8-12 years girls teams pick up a silver medal in both 4 x 50m medley and 4 x 50m freestyle relays and she was quietly thrilled with her contribution to the teams achievements. "I am feeling really confident with my swimming at the moment and the two silvers in the relays with Brooke Copsey, Shianne Plunkett and Annali Philpott in the medley and Brooke, Shianne and Camille Bebendorf in the freestyle, were the highlight of the weekend for me. Nominated swimmers will now focus their energy on their representative duties for the Capricornia School Swimming Team when they travel to Brisbane to compete in the Queensland School Sport Swimming Championships later this month.